Mönch (4107m) and Jungfrau (4158m) are among the most famous peaks in Switzerland and are situated nearby the biggest tourist center in the Bernese Oberland. The two peaks are in row with the notorious Eiger. Climbing these two peaks is a serious challenge for every mountaineer and requires good both proper training and adequate equipment. Kleine Scheidegg, is situated on 2029 meters altitude. From here we will take the famous Jungfraubahn train which will take us to Jungfraujoch. This part of the railway is 9,6 km, 6,4 km of which goes under the mountain in a tunnel. 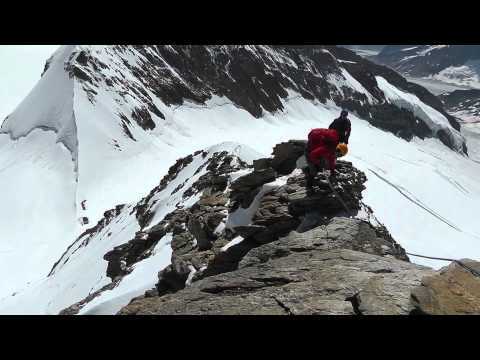 Mönch is the most climbed peak from the trilogy including also Eiger and Jungfrau. It has easy access from the last stop of the mountain railway and offers few good routes to choose from. The most popular is the South-East ridge, which is our first goal. This route offers climbing on snowy-icy ridges and easy climbing on gneissic rock. Jungfrau is the highest peak in the trilogy. Most climbers spend a night in Mönchsjochhütte hut before going there, which allows them to receive certain acclimatization. Our goal is its Southeast Ridge and the ridge Kranzbergegg. The route is of a low technical difficulty however there is some rock climbing before getting to Kranzbergegg. Reaching the saddle of Rottalsattle and the leading to the peak Southeast Ridge offers climbing of 40-50 degrees snowy-icy slopes. The group is maximum 2 people. - Train tickets from Lauterbrunnen to Jungfraujoch. Arrival and accommodation in Lauterbrunnen. Meeting with your guide in the evening, equipment check and briefing. After the train brings us to Jungfraujoch we will have a short walk to the foot of the Southeast ridge. Here we have easy rock climbing at the beginning and at about the middle of the ridge start the first snow covered parts. Up to the top we will traverse on mixed snow and rocks terrain. Shortly before summiting we will pass by a beautiful sharp ridge. This will be an early start in the morning. We will go to Jungfraujoch where we will leave all the extra luggage and then continue by the Jungfraufirn Glacier. Climbing on steep snowy and rock terrain will lead us to Kranzbergegg. From here on we will continue to the Rottalsattle saddle. When reaching it our route will follow the Southeast Ridge, which bring us to the top. To accomplish the climb you need to be in excellent physical condition and to have previous mountaineering experience including few long outings, self-arrest technique, use of an ice-axе and crampons and rock climbing max. grade 3.